"I feel grateful to have found this book only a year into my PhD. It has opened my eyes to the world of academia. There is more to a PhD than just research in the sense of working on a problem, getting some results and publishing your findings. This book has allowed me to open my eyes and see all the other things I should be doing to fully succeed at my endeavour of becoming a researcher myself." 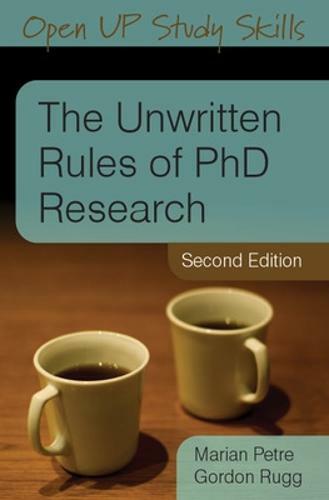 This bestselling book on the process of PhD research provides readers with engaging discussion and comprehensive guidance on aspects that other books don't usually mention. Covering all the key topics of the previous edition, including what a PhD is really about, how to do one well, how to decipher what your supervisor actually means by terms like 'good referencing' and 'clean research question', and how to design, report and defend your research,the authors continue to offer an accessible, down-to-earth, and insightful account of the whole PhD process. Their advice addresses how to avoid some of the pitfalls en route to a successful submission. Critical thinkingResearch skills The route to research independenceDifferent models of studyThe Unwritten Rules of PhD Research is essential reading for anyone considering a PhD or embarking on one. It will tell you the things many students wish someone had told them before they started.